Use this tutorial to adjust the colors in auctions where you don't know how accurate the pictures are. 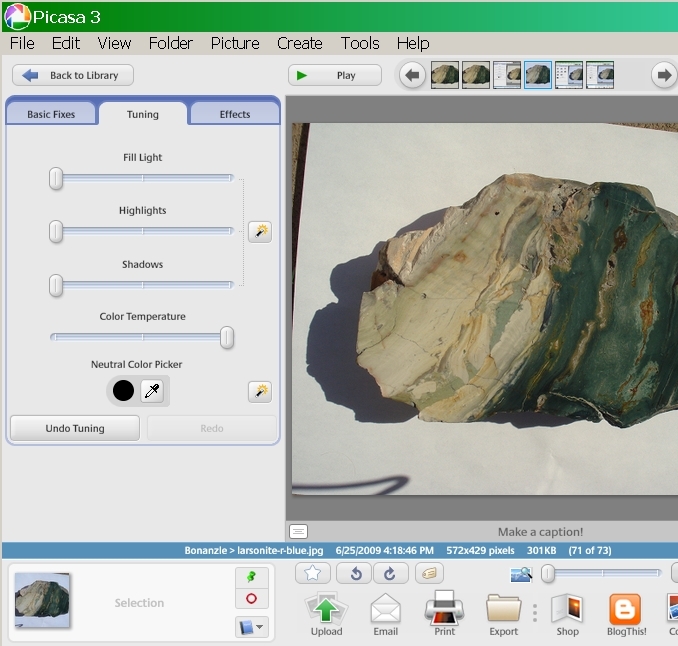 This tutorial allows you to adjust photos for free using the free Picasa 3 software from Google. This tutorial uses a photo with a known white background. Note also that photos taken in sunlight frequently have blue shift which makes colors appear more blue and/or violet. This picture of rough was taken in full sunlight but the colors are NOT ACCURATE. The seller's original photo. I wanted to see the REAL colors in this stone. 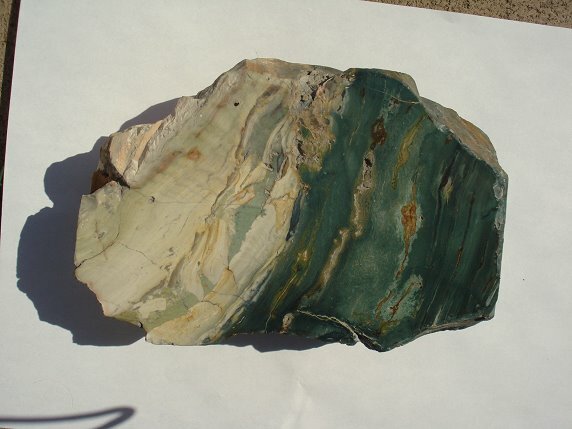 Does the rock have blue-green colors? Note that the seller specified that the background of this picture is pure white so the fact that the color appears light blue indicates that this whole photo is skewed to the blue spectrum. Photo adjustment to show real colors. The bluish-green is actually more like a forest green color. The process to obtain this picture is explained in the tutorial below. 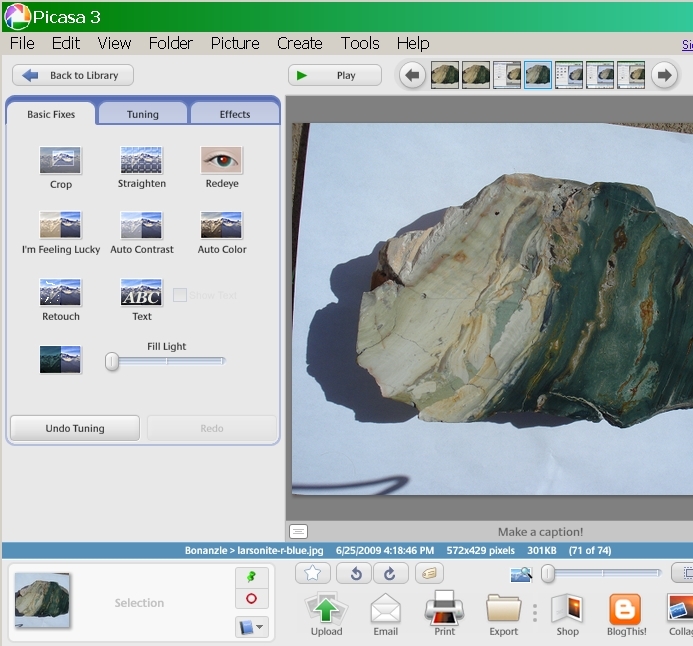 Step 1- We are going to use Picasa 3 from Google to make adjustments. The nice thing about this program is it is free and easy to use. It doesn't offer the fine tuning you get from a program like Corel but for most photos it does the job. 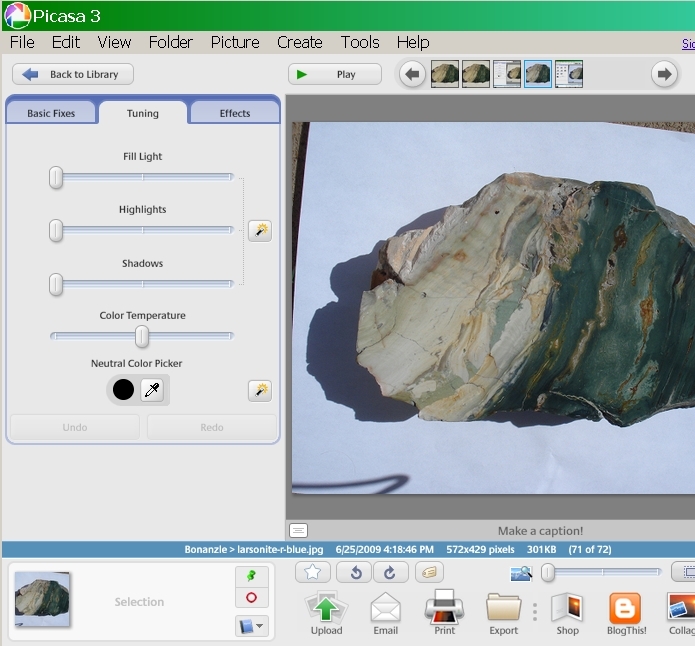 Step 2- Now after installing Picasa 3, open the photo in the program and hit the Tuning Tab. Step 3- Now move the slider on the bottom to the right to change the background color from light blue to white. We can now see the rock with more accurate colors. Simply save the new file and you have a more accurate picture of the material. The idea is to match a known color (white) in the photo to a known color on your desktop. As I mentioned in the first tutorial you can use this same process with any picture where you know a part of the picture is white. So it would work with a stone with white inclusions for example even if the background was black. Note that the other sliders in the program can be used also to make minor adjustments but the main attribute to fix will usually be the color temperature. So here is the final picture again showing accurate colors.